Make great impact by heat embossing in white on colorful paper. 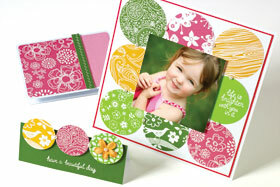 Punch large circles from a variety of colorful notecards. Stamp the Design Block background images as well as the “life is brighter” message from the Sky’s the Limit set with Versamark ink and heat emboss with White Embossing Powder. Add to a white background. Mat with pink. Add a photo and Medium Accent Pearls. Punch three circles from colored notecards. Stamp backgrounds with Versamark ink and heat emboss with White Embossing Powder. Adhere to a Green Notecard that has been cut in half. Stamp the “have a beautiful day” greeting with Versamark ink and heat emboss with white. Add an Art Flower and Medium Accent Pearls. On a Peony Notecard, stamp the Scattered Flower image with Versamark ink and white heat emboss. Trim and round the corners. Add to Pink Notecard along with a strip cut from a Green Notecard. Try embossing with clear powder instead for a more subtle look. Due to the large size of the DesignBlock images, they offer a fun way to cover lots of punched pieces at once.